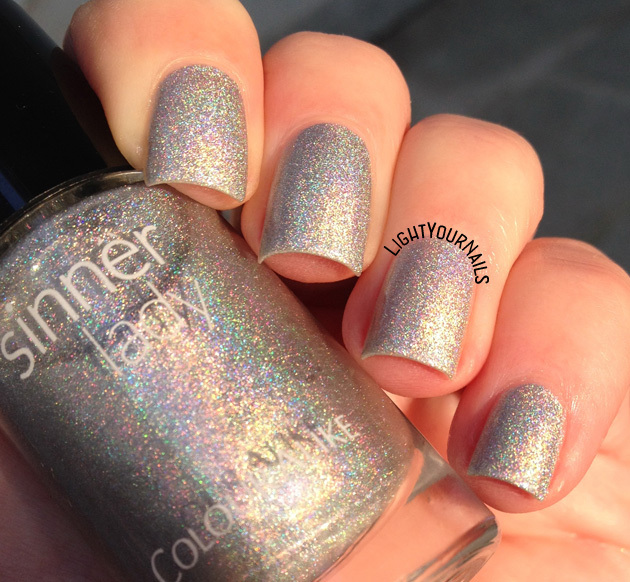 ABC challenge: Colour Alike Sinner Lady | Light Your Nails! My C choice for the ABC challenge is Colour Alike Sinner Lady. Nothing too fancy here, it's a standard silver holo. Plus the holographic effect is quite delicate. I loved the name though, and I just needed it in my stash! Il mio smalto C è Colour Alike Sinner Lady. Niente di particolare, un normalissimo argento olografico. Tra l'altro l'effetto holo non è granchè. Adoravo il nome però, quindi dovevo averlo! It will come handy as a nail art base I guess! Not worth getting if you are looking for a super flashy holo though. That's it from me today, migraines hit me again unfortunately. In case you need Colour Alike Sinner Lady for its name like I did you can find it at www.colouralike.com. Mi tornerà utile come base per qualche nail art spero. Di sicuro non fa per voi se cercate uno smalto olografico con effetto sparaflashante. Nel caso voleste il Colour Alike Sinner Lady per il nome, come me, lo trovate su www.colouralike.com. When everyone found out Colour Alike! Anche io ho un paio di arretrati che vorrei, aspetto nuovi lanci però! I like this subtle holo effect. I think that it is a pretty polish! Forse non sarà lo smalto top del brand, ma Colour Alike è una grossa carenza nei miei Helmer! Quello è poco ma sicuro. It is a sweet and delicate shade and I think one should have such polish in stash. I wonder how this compares to OPNL Sizzler or Orly Mirrorball? I am such a sucker for the dizzy-holo finish. I am pretty sure it's nothing like Orly Mirrorball. This one has no extra sparkly glitter added. I always love these more soft holo finishes, they aren't as in your face! I usually like them, too, but I'm not a silver lover to honest. I don't mind a subdued holo, this is pretty. Pretty! Hope you feel better! That is really pretty! I can't wait to see what nail art you do with it in the future! I like delicate holos! This is really pretty! I hope you're feeling better! This is a very lovely polish, I like having staples like this in my stash. These look amazing! I love anything glittery. Is it easy to get off? It's no real glitter so yes, very easy to remove! Sorry I don't post comments containing links. Effettivamente il colore è "onesto", ma il nome spacca (tra l'altro...scritto addirittura sulla boccetta)! Haha that's true! Thanks Dina! Looks like a great silver holo!